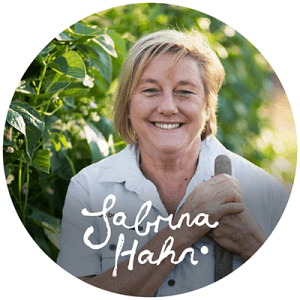 “I have worked in the Western Australian horticultural industry for the last 40 years. I am passionate about helping people gain a better understanding of nature through gardening. I began trials with Grow Safe fertilisers ten years ago and was so impressed with the results, I have been using it exclusively ever since. There was a noticeable improvement in plant health and production, from fruit and vegies to large commercial landscape jobs. When you buy your seedlings, leave them hanging around the veranda for a week before planting out. Only water them twice, make sure they get root-bound and wait for them to flower before planting them out into the vegie patch. I guarantee you will have the best crop of tomatoes. This harsh early start to life sends a message to the plant to leap into flowering as soon as possible as a survival mechanism to ensure seed set for the next generation. Tomatoes that are put into really rich soil before they flower will immediately think they can live off the fat of the land. They will put all their energy into growing lots of beautiful long stems, thick with lush leaves, and will forget to fruit. This is the main reason for delayed fruiting. Once your seedlings have set flower you will need to start the feeding regime. Tomatoes are gross feeders, so make sure you have lots of good organic matter in the soil – compost, poo and, if you can get them, some worm castings. Use a fruit-and-vegetable fertiliser and rock dust. Tomatoes will absorb all those important minerals that we then eat. 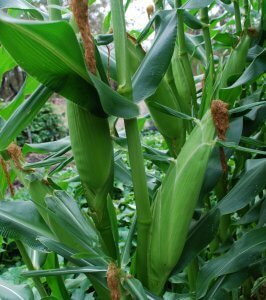 Crop rotation is a really effective way of controlling pest and disease problems. While the majority of soil biology is highly beneficial, some plants are susceptible to plant pathogenic fungi & bacteria – if you keep planting the same crop in that position it is only a matter of time before it attacks your crop. All the Brassica family (broccoli, cabbage, cauliflower) is vulnerable to club root disease and if course the cabbage white butterfly. 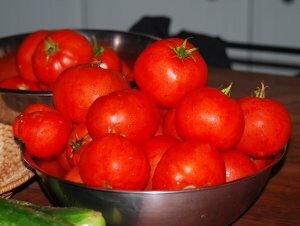 Tomatoes are prone to getting wilt, root knot nematode and blossom end rot. By moving crops around and planting them among other veggies it lessens the chance of a disease getting hold and confuses pests. The other factor to consider is that each type of veggie has different nutrient and water requirements. Most veggies grow in a neutral pH but peas and beans prefer dolomite lime in the soil prior to sowing. Beetroot needs boron added to get a good size beet. Crop rotation is particularly important when it comes to long-term crops like eggplant, potatoes, onions and garlic. Any root crop like potatoes could be replanted with peas and beans adding nitrogen to the soil. Tomatoes, capsicum and chilli could be later planted with sweetcorn and zucchini. Cabbages, broccoli and cauliflower should be replaced by a green manure crop like ryecorn or tickbeans. These are simply dug back into the soil. After the green manure crop replant using tomatoes, capsicums and eggplants. The Sweet Potato is not at all related to the common potato, its more of a tropical ground cover with large tubers that prefer growing in warmer climates and a wet summer. There are many different varieties with red, purple and orange skin and either orange or white flesh. I love the white-fleshed purpled skinned variety, it is nutty and creamy and unbelievably good roasted in the coals. The orange fleshed on is almost as sweet as pumpkin when cooked, beautiful mashed or in soups. 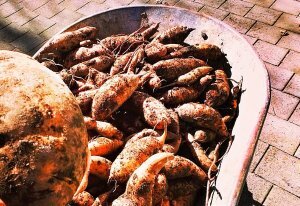 Sweet potato is named Ipomea batatas and is best to plant out in Perth around October when the soil temperature is warmer. It’s a long term crop and won’t be ready to be harvested until April. The most important factor to remember is to grow your sweet potatoes from the cuttings, not the tuber. Cut a length of cutting 30cm long, remove all the lower leaves, plant it out horizontally just below the soil, leaving only the top two leaves exposed. I recommend rock dust and slow release fertiliser for sweet potatoes, if they get too much nitrogen you will end up with a mass of leaves and vine, but tiny tubers. Potassium and low levels of phosphorus is ideal. The hard thing about growing strawberries is that every other living creature loves them as much as we do. Birds, slaters, snails, rats, dogs and possums. When I lived in Esperance I had a blue-tongue lizard that came past at the same time in the afternoon to have a feed and waddled off with a very red smiley face. So, the way to overcome some of these obstacles is to grow your strawberry plants in a container up off the ground. Slaters and snails are usually the main problem and easily dealt with if you put a barrier around the container. Strawberries need regular watering every day when they start to fruit, so growing them in a container makes it easier to achieve this and saves wastage of water. Always use a good quality wetting agent and water retainer in the mix or in-ground to keep the water supply available to the roots all summer. In-ground strawberries should be watered by drip irrigation to avoid the spread of disease. Strawberries need a free draining soil that is slightly acid soil (pH 6 – 6.5) with added compost, cow poo and mulch. Do not use chicken poo or mushroom compost as this will be too alkaline. They like sun, but need protecting from the hot afternoon sun in the summer months. The great advantage of growing strawberries in a container is that you can move them around to just morning sun in summer and all day sun in the winter months. 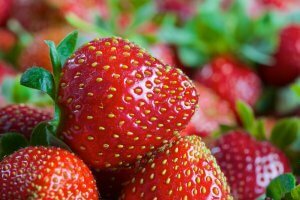 Most strawberry plants become available in nurseries from October onwards and should produce fruit within a month. They need regular feeding when the flowers appear. If you grow them in a container, reduce the fertilising to half strength to avoid over-feeding.